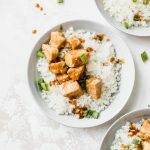 This Honey Garlic Chicken is a one skillet kind of meal! Just 5 ingredients in the sauce and the cauliflower rice makes for a healthy side. Break cauliflower up into bite-size pieces; place in a saucepan on the stovetop and cook until soft. Cut up chicken into bite-size pieces and place in skillet with olive oil, cooking on medium-high heat and stirring occasionally so chicken cooks thoroughly. While chicken is cooking, mince garlic and set aside. Once chicken is cooked, add garlic to the skillet and stir, flavoring the chicken. Once garlic starts turning golden in color, pour the soy sauce, sesame oil and honey overtop of the chicken, stirring to evenly coat the chicken. Add flour to thicken up the sauce and simmer chicken on low for 3-5 minutes, ideally placing a lid overtop of skillet. By now, the cauliflower should be done, so drain cauliflower and place it in a food processor; pulse for 5-10 seconds, until it resembles “rice” in size. Pour cauliflower rice into a bowl. Once chicken has absorbed most of the sauce, pour it overtop of rice; drizzling any additional sauce from the skillet overtop.